Sock has wacky audio adventures or sometimes just chats with his friends at a reasonable speed! 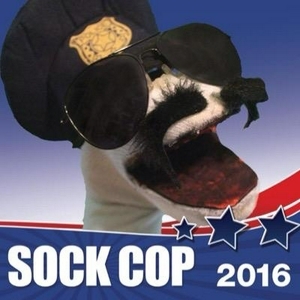 Sock Cop gives a quick update on what's been goin on lately and whatnot. First time trying out the Anchor app gimmick, just for funsies. Smooches for youse! Sock reviews an episode of The Many Loves of Dobie Gillis, we spend a Minute With The Southern Gentleman, then Sock meets some Weird Horses! Sock Cop has a very strange experience in a creepy castle, and has to save the day! Ft. @Dopponline and Moe. Sock Cop reviews Black Panther (even though he hasn't seen it yet) talks about a lesser-known superhero named U-Turn Bill, and analyzes more dreams! It's an all new season of the podcast! Sock Cop answers YOUR burning questions, analyzes a dream, and wonders what it would be like to be a radio DJ. Featuring music by Pillboy, Bass Guy, and Jeve Stones. Sock and his buddy Lindsay talk about Blockbuster and why you shouldn't go to walmart late at night. The ridiculously talented Weird Paul talks to Sock from his headquarters in Pittsburgh PA about his music, his videos, and the new documentary being made about him. Go to weirdpaul.com and tell him how awesome he is! Super talented artist Craig Smye (craigsmye.com, @CraigSmye) chats and gives advice on how to get started doing things, even if you don't quite finish them. Plus, he's Canadian! A very special SockCast features @KittenGrenade as she talks about motherhood, her music, and why she was traumatized by Chuck E. Cheese. She has new music out on bandcamp, go buy it! This podcast includes 2 Kitten Grenade songs and a "Special Acoustic Version Of The Sock Cop Theme"
Sock and OGVHS talk about Pokemon, hunting for VHS, and figure out that Benjamin Franklin is probably a vampire. Sock and Uncle Henry talk about dragons, bacon grease, and stopping speeders! Tweet him @unclehenry and tell him you heard the podcast! Comedy video maker and handsome English gentleman Inadequate Chris stops by to talk about videos, tea, and big ol' clocks! America's Sweetheart and former #Periscope celebrity Shelly Green calls in and talks about whatever she wants because she is Shelly Green! Sock's good friend Crazy Deb (@Chloesullivan89) stops by to talk about weird pets, binge-watching, and we play some Mad Libs! Twitch streamer Smoot stops by to talk about game shows, video games and other things that aren't games! This episode was recorded in front of a live studio audience. Plus, hear what happens when Sock walks around downtown Mobile, AL and talks to strangers! Everyone's favorite Australian Adam Cinemre stops by to talk orbs, accents and nicknames! Follow this man on the social things. @AdamCinemre. You're welcome, ladies. Mobile, Al based punk band the Handsome Scoundrels (@scoundrelsal) drop by to talk music, pizza and.......well, that's mostly what they talk about. Our buddy Satan stops by to discuss technology, old video games and Sarah Jessica Parker! Rated PG-13 for wiener jokes. Stand up comic and super nice guy Natty Bumpercar brings along some of his friends to talk about their whimsical world of CoffeCan Alley! Check out more of his #PremiumContent at nattybumpercar.com! Sock and punk rock fan Chris talk about unexplained phenomena and their favorite bowlers.